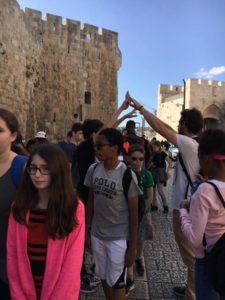 Day 5 – The students had an amazing day learning about the three monotheistic religions who treasure this holy land. 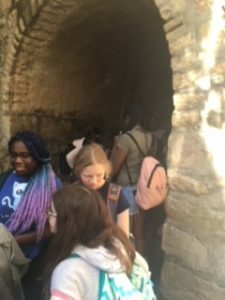 They walked through ancient tunnels, knee deep in water, with headlamps, and they helped each other navigate the tunnels the entire time (photo below is some of us exiting Hezekiah’s tunnel). Later in the night, the students went to the Western Wall in Jerusalem at sunset. In the background, they could hear the Muslim call to prayer as they walked through security gates into a large plaza filled with people. 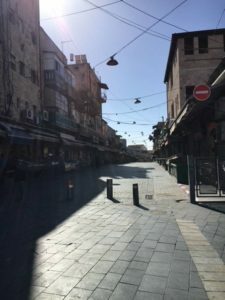 Then they walked back to the hotel through a quiet city on elevated railway tracks because all public transportation ceases in Jerusalem in honor of the Jewish sabbath. 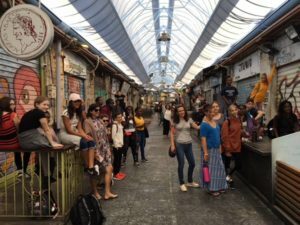 Day 6 – In the morning they went on a walking tour of Jerusalem, first stop: Mahane Yehuda, Israel’s most famous outdoor food market. However, this Saturday morning, it was completely shut down and the metal storefronts, which one normally doesn’t see, displayed colorful graffiti art. At the church, they learned that it was the original burial place for Jesus of Nazareth. 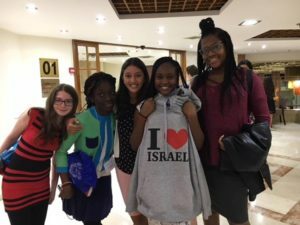 The church was as packed as a New York subway, with tour groups from around the world, and our students did a great job sticking together. 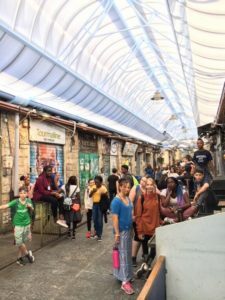 In the afternoon, they went to Gan Sacher, a park where the students romped on the playground with others and played soccer. 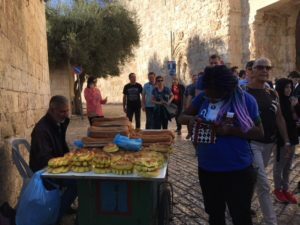 Before the park, some of the students met their Israeli family and celebrated tour guide Or-Shir’s birthday with a gorgeous cake and some treats her grandmother brought. 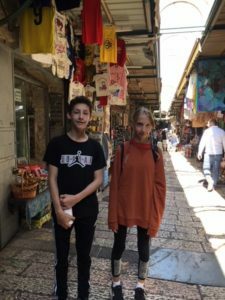 In the night, they spent an hour and half out on the town buying bracelets and tee shirts and had dinner at Jerusalem’s pedestrian mall, or Ben Yehuda street. The kids have been great at following directions, so the chaperones allowed them to shop in pairs of three and everyone made it back to the meeting place not only on time but early! See photos below. Tomorrow their second week away begins! Stay tuned for more updates.